Superman versus Thor: who would win that epic battle? That's the question answered in the latest video in the Super Power Beatdown. 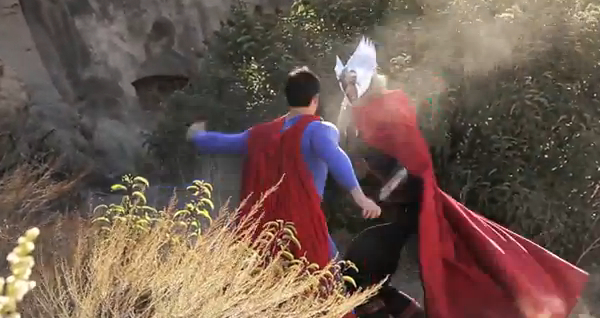 Based on a viewer poll, this video depicts a fight between the Last Son of Krypton and the God of Thunder. Check it out. What do you think of the video? Who do you think should win? What other match-ups would you like to see? I bet I know which one will win at the box office this year. That's a close call. My money would be on Thor though. Lets get some ice for that burn. they both have their limitations... but both from another world... one can be stripped of his powers and the other has home planet weaknesses... one is a god and the other finds strength from the sun... thor has the advantage, he is strong everywhere. i would like to see batman vs. iron man... cause they are man made heroes who use their money for tech-toys. Happy Free Comic Book Day 2013!